Iran had been a country I was longing to go to for a long time already, because of the political situation and because many other travellers had described it to me as the “hitchhiker’s heaven”. When we finally got there, my first impression was not the one of the mosques in hot weather with camels next to them, but that it was freezing cold and everything was covered in snow. In addition to this, the language didn’t change much either, as the Azerbaijan language and culture resembled the Turkish one a whole lot. Over time though, we travelled from these snowy mountains via a very polluted but lively Tehran, to the hot South where I was finally able to see camels and deserts and the whole culture gradually becoming a lot more Arabic. All of this in less than a month. The whole time, we were welcomed by an overwhelming curiosity and hospitality. At the same time though, we were also met with a wide variety of bans and laws which we learned over time how seriously we had to take them. On top of all this, we restructured Spicyroad with a new group and changed core aspects of our project. All of these things definitely made Iran a very unique leg of our journey. In 1979, Iran became ‘The Islamic Republic of Iran’ during the Islamic Revolution, through which Ayatollah Chomeini became ‘Supreme Leader’. The Islamic Revolution happened out of an anti-western atmosphere; many countries supported the autoritarian Shah Mohammed Reza Pahlavi and the UK and the US also supported a coup d’etat in 1953 in order to get exclusive oil rights (for what is BP today). Since then, the country’s leadership has implemented radical islamic laws that among other things, ban any drugs, western music, political demonstrations and restrict women in many fields. For example, women by law need to cover their body, wear the chador and are not allowed to wear tight pants, ride bicycles, become judges or take the position of ‘Supreme Leader’. In many cases, for example if they want to travel out of the country, they need the permission of their father or husband. Our journey in Iran started in cold Tabriz and our first couchsurfing host, Alireza. Even though he provided a nice, warm place for us and was very hospitable, he managed to make us a tad paranoid by telling us that we needed to hide the fact that we were staying at his place. He said if the neighbours found out, the police might harrass him under the suspicion of working with foreign spies and told us that it had happened before. At the same time, our female group members needed to get used to wearing the hijab properly. We roamed around the bazaar, chatted about politics and open relationships and managed to get into a shisha lounge even though women normally are not allowed to smoke. We would get to see this privilege of ours as foreigners more in the next few weeks in Iran. In Tabriz, we also started a discussion about the direction of the project and the content we wanted to present. Over the next two weeks, we changed our posting structure a lot and had multiple meetings in which we brainstormed about our core values. We realized that we didn’t just want to be a travel blog but wanted to concentrate on the feminist and racist issues, as social travelling for us is just a means to get to these aspects in different places. From Tabriz we quickly went over Quazvin to Tehran, the capital. Here the weather was already a lot more moderate, but then again we had to deal with the city’s overwhelming pollution. Due to the bans on the economy, most cars and scooters in Iran drive with very old engines, which result in a constant cloak of fog that blocks the view of the big mountains behind the city most of the time. While in Tehran, we saw a very different side of Iran from the one which is mostly displayed in Western media. Even though we didn’t like the city itself that much due to the noise and the pollution, we met incredibly cool and open-minded people. We hitchhiked at nighttime across the big city while singing to loud Rnb music on our way to pick up Bin, our newest member from Korea, from the airport. We also drove deep into the snowy mountains for a secret birthday party with booze and pantomime games. We got to know that it is a common practice to have parties outside of the city in order to avoid neighbours calling the police on you. It is actually interesting how different Iran is outside of people’s home compared to behind closed curtains. On the street, people might be more careful with the laws and wear the hijab, but in their private homes, all these rules are often ignored. Women don’t wear a hijab, there is alcohol and foreign music and TV gets played. Even though we had a lot of fun in Tehran, almost everyone in the group fell sick during this time; Ia was even coughing up blood and needed to visit multiple hospitals. We suspect that it was linked to the pollution as all our symptoms quickly disappeared after leaving Tehran behind. 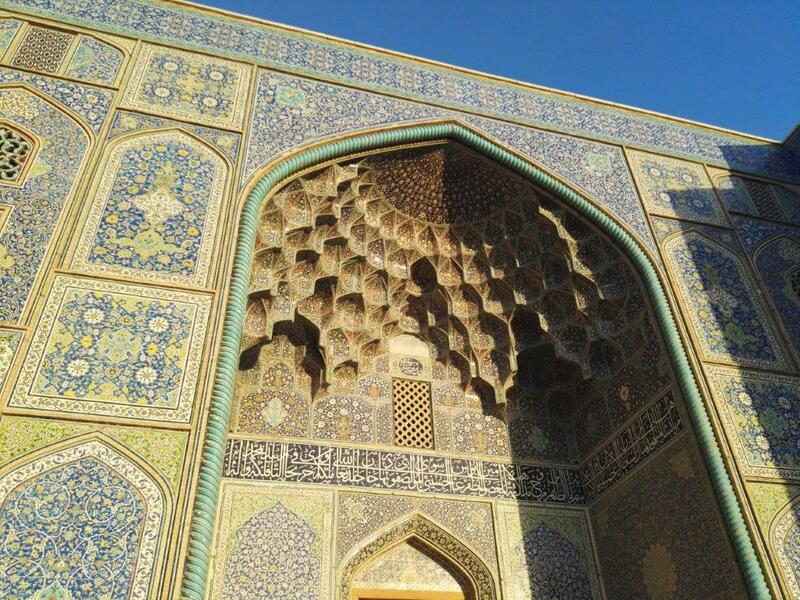 The next stop for us was the second biggest and supposedly most beautiful city of Iran, Esfahan. Everyone was happy to be travelling again. Generally, hitch-hiking in Iran was quite different from Turkey, as there is no common word for hitch-hiking in Iran and the concept is not very popular. On top of that, every car can be a taxi in Iran and will let you know that. Often we were dealing with very friendly, but confused people who tried to figure out what to do with us weird foreigners. But in the end, we never really needed to wait long and were most of the time greeted with a happy ‘Welcome to Iran!’. In Esfahan, we stayed with our funny host Reza and his cute dog Shanti. Everybody cured themselves while we visited the mesmerizing mosques and bridges of the city. Sadly, the bridges nowadays just cross a long patch of dirt which was once was a river. Through communal mismanagement and global warming, the water has slowly ceased and is now a sad reminder of the growing rarity of water. Iran has a huge problem with water management and big parts of the country are threatened by desertification if major changes are not taken to solve the issue. From Esfahan, we went further South and stayed in the little village of Ghalat, also known as ‘Little Amsterdam’. The peaceful little village defies the strict drug laws of the country and was for us a nice place outside of Shiraz to relax a bit after all the health problems. From here, we visited the imposing ruins of the ancient city of Persepolis and we managed to have an international christmas dinner with our hosts and other guests from China and Turkey. By now we were far enough south for the temperatures to be nice and warm and we decided to extend our visa to have some more time to get to know the small islands on the Southern coast. So from Ghalat/Shiraz, we went over Bandar Lengeh and the oil fields straight to Bandar Abbas to renew our visas and apply for the Indian visa there. Down in the far South now, we could finally see camels, lots of desert and the striking blue water of the Persian (Arabic) Gulf. As typical Iranian food seemed to mostly consist of kebab with rice and there weren’t many vegetarian alternatives till now, we were thrilled to welcome the delicious Falafel of the South into our lives! After a long ride towards Bandar Abbas and a camping trip on the way, we were warmly welcomed by our next hosts, a family with 3 small girls. Just recently the girls had started having to wear the hijab, which they hated. Whenever they came home, it would be the first thing they got rid off. We also learned that their mother had been arrested previously for publishing critical articles in a local newspaper and was forced to give up her profession as a journalist in order to stay with her children. It was a grim reminder that this country is not as friendly and hospitable to everyone as it was to us. Together on a rooftop, we celebrated into the new year and on the next day, we went to extend our visas and apply for the Indian visa. Unfortunately, our visit to the consulate didn’t go as smoothly as we had hoped, and were instead frustrated to find out that the consulate needed a proof of identity from our embassies in Tehran – which could be up to a week-long detour. As that would take a lot of time, Ia, emka* and I (Yannic) decided to go earlier to Dubai and apply for the Indian visa there, while the other half wanted to stay behind to explore the islands and later travel on a shorter e-visa to India. Shortly after, Ia, emka* and I were rushing to the ferry terminal only to witness one of the most bizarre border crossings that I’ve ever experienced. Nobody checked our passports properly, I skipped the security check by making small talk and Ia too because of her blue hair, whereas emka* had the most random and intense security check ever. But after a long wait we were on the seaway to Dubai and had to say goodbye to Iran. It was a weird feeling as it seemed too rushed and forced. Soon after we left, Eyrun, Ezster and Bin went to the islands of Hormuz and Qeshm and had some alone time camping on the beach. Unfortunately, they witnessed a stark contrast in the way they were treated without a male member in the group, as men were regularly catcalling them and following them around. Towards Bin in particuar, this sexism was often paired with racism. It left a bitter aftertaste for them as they strongly felt that people only respected them when they were in company of a men. All in all, Iran was the country where we experienced the biggest variety of climates, as within 3 weeks we went from snowy montains to desert, camels and the ocean. It wasn’t the biggest culinary sensation for us but certainly an interesting country due to the political situation, the people we met along the way and the hospitality we received everywhere. The people were very welcoming to us in Iran and I’ve rarely experienced curiousity in such a gentle and polite way. Unfortunately, women are actively discriminated in everyday business and by law. Many people expressed their desire to leave the country because of the repressive regime and the bad economic situation, especially women who were often dreaming of living in a a more equal society. In total, I definitely loved Iran though and I’m fairly sure it will see me again. But that is easy to say for me as a man.